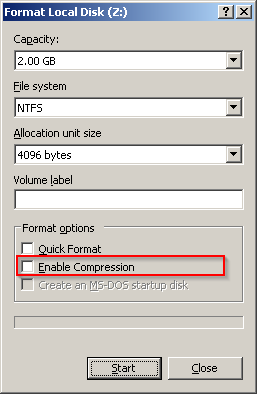 I cannot seem to get disk compression option to tick, I've tried on an existing image file and a new one. Can anybody help me get it activated please as I have a 2gb ramdisk thats only using about 200mb on average. This option does not reduce the size a disk takes up in the RAM. It however reduces the space taken up by files on that disk. If you are using an image file, you just need format your disk for NTFS and tick the option there. ohh so like standard disk compression on an NTFS disk. I kinda hoped it was to compress the image before saving/flushing to disk on closing/shuting down.